During preparation for painting the presence of asbestos in a substrate presents a potential health hazard. Unlike lead in paint there is no spot test that is available to confirm the presence of asbestos. Asbestos causes lung cancer and other cancers, and other lung illnesses such as asbestosis. The first symptoms may not appear for 15-20 years after exposure. Asbestos was used widely from the 1820s to the mid-1980s in roof tiles, wall claddings, vinyl floor coverings, sprayed fire protection, decorative ceilings, roofing membranes, adhesives and even paints and gaskets. 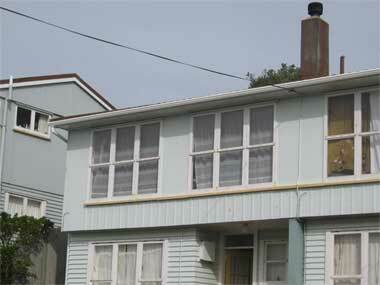 Asbestos was part of any fibre cement type sheeting that was manufactured prior to 1982. This includes Super Six roofing and flat sheet fibre cement cladding product. 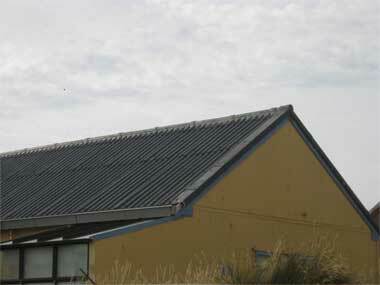 Malthoid, an old roof cladding made of felt impregnated bitumen also contained asbestos. Nuralite (resembles butynol) is another roofing material that contained asbestos. Asbestos may also be present in old textured ceiling coatings and as the backing to old lino floor coverings. When undertaking maintenance painting of any structure in which any of the substrates above are present, questions re the age of the building element should be asked and if they pre date the dates when asbestos was removed then preparation must be undertaken in accordance with the relevant OSH guidelines. See www.dol.govt.nz and search for asbestos guidelines. If a person is unsure that asbestos is present then they should consult an experienced person prior to commencing work on asbestos containing material. If products containing asbestos are in sound condition and left alone, they don’t pose a big risk. Problems mostly come when materials are cut, sanded, waterblasted or broken up – thus releasing fibres. All three types of asbestos – white, blue and brown – are dangerous. Removal and/or disposal of asbestos containing materials may require special permission and involvement of a licensed removal company and notification to the land fill. The asbestos containing material can then be removed according to established safety practices and disposed of according to local Council bylaws. Contact your local council to find out their requirements. The identification of asbestos requires sending a representative sample of the material to a specialist laboratory. There are three laboratories that offer this service, Capital Environmental Service Ltd, www.fibres.co.nz, located in Wellington, Dowdell and Associates, www.dowdellassociates.co.nz, located in Auckland and Hazmat www.hazmat.co.nz located in Christchurch and Wellington. If you are considering repainting of any of the above substrates that may contain asbestos then for confirmation of the presence of asbestos and asbestos type along with testing costs please contact either of the afore mentioned laboratories.